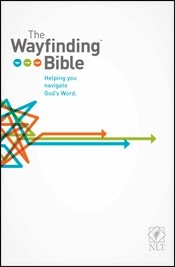 I've had the opportunity here to check out a new Bible, The Wayfinding Bible from Tyndale House Publishing. I'll point out right off the bat that this NLT version is available at 50% off this week (Dec. 2-8), which would make it under $20. I have really liked this Bible. I've never really read NLT and I don't know a whole lot about the translation methods. There is, of course, a section in the front talking about it, and how the translators tried to use a direct word-for-word translation, but when that really didn't make sense, they were doing more of a "dynamic equivalence" translation -- trying to make the meaning come across. From what I have read of this Bible, I have been very happy with the readability and it sure seems to convey meaning similar to other English-language Bibles. Personally, my take is that I want to be able to use a variety of good translations, and I'm thrilled to have a physical copy of a new translation for me. The flyover route includes 54 readings that give you a basic chronological overview of the entire Bible. The direct route has 215 readings, to give you familiarity with most of the Bible and how it all fits together. One thing to note is that all of the flyover readings are part of the direct readings, and all the direct readings are included in the scenic ones. So if you follow all three paths, you will hit the 54 basic overview readings three times, over about 22 months, if you do one reading every day. I started off by doing the Flyover Route, mostly so that I could see how that works in order to write this review. I wanted to get out of Genesis before writing! The Flyover Route has seven readings in Genesis, where the others have 21 and 30. So by doing the Flyover Route, I was able to get all the way up into Ezra. What do I think? I really am enjoying these readings. Most days, you start off with a couple of introductory paragraphs that help explain what else has happened, or what is happening. Then you read a chapter or so of the actual Bible. That is followed up by an Observation Point and an Exploration Point. These give additional information about the culture or something similar (Observation) and some sort of application message (Exploration). For instance, in the story of David and Goliath, the intro material talks about Samuel annointing David, and the battle against the Philistines. The text is 1 Samuel 17. The Observation Point has to do with the stones from the stream, and how fast those rocks would likely be traveling. The Exploration Point has to do with trust, and knowing where real power comes from. This particular reading also includes some geographical information about the Valley of Elah, including a map. Other pages include charts, photos, archaeological information, etc. You are tied to reading this using any of the Wayfinding Routes either. This is a complete Bible, and you can read it straight through, or according to any other plan you wish to use. You'd still be able to check the various features, obviously. My bottom line: I am really enjoying this Bible. I have read straight through the Bible multiple times, I've listened to a couple different audio versions a couple of times, I've read through a chronological Bible as well. I'm finding this quick overview to be really interesting, and I plan to go back through on the Direct Route, maybe with my kids coming along for the ride. If we work through 215 readings on weekdays only (which is realistic for us) then it would take us 43 weeks to go through that route. Sounds like a great plan to me. We'll be stopping to read the book introductions too.